The Football Association has charged Arsene Wenger for verbally abusing and pushing a fourth official. During Arsenal’s clash with Burnley on Sunday, Arsene Wenger was sent off to the stands in the 93rd minute for reacting angrily to referee Jon Moss’ decision to hand a late penalty to the away side. But the Frenchman instead stood at the entrance of the tunnel to watch the final few moments of the game instead of going all the way inside. 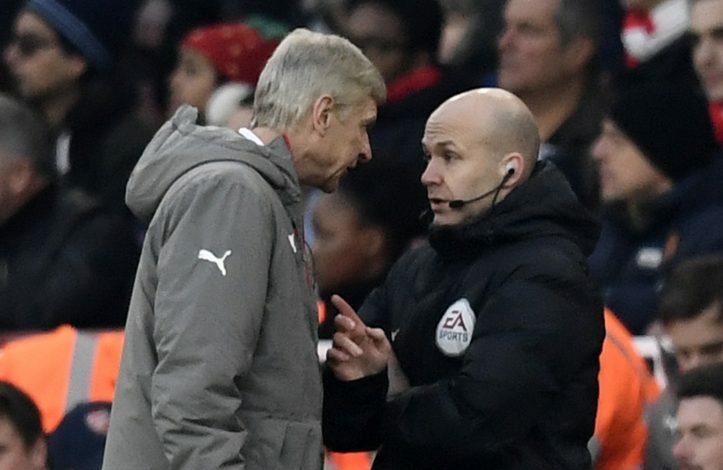 When urged by fourth official Anthony Taylor to move inside, the Gunners’ boss was seen verbally abusing and pushing Taylor. And now, the Football Association has reached a verdict on Wenger’s actions at the Emirates, and the 67-year-old has been charged for misconduct. The FA’s official statement read: “Arsene Wenger has been charged for misconduct following Arsenal’s game against Burnley on Sunday [22 January 2017]. “It is alleged that in or around the 92nd minute, he used abusive and/or insulting words towards the fourth official. It is further alleged that following his dismissal from the technical area, his behaviour in remaining in the tunnel area and making physical contact with the fourth official amounted to improper conduct.